One of the most desired styles for natural stone thresholds is usually related to the classic cream, brown and beige colors. Exactly how much of these colors dominate the surface will determine whether it stands on the light or darker side. Typically the most popular kind of natural stone thresholds that builders prefer is the lighter side because it’s a more neutral tone that appeals to most buyers. Stonexchange, a natural stone threshold distributor located in Miami, Florida, specializes in supplying the finest Crema Sahara Marfil Thresholds in the South Florida area. Marfil, also known as “ivory” in Spanish, is the top choice for building contractors in the Miami area. Because of the blaring sun, contracting designers tend to favor the lighter colors. It reflects the light and it’s less likely to fade like the heavier color construction materials would over a period of time due to the harmful UV rays. In addition to the ivory-color, marble holds up pretty well against the sun’s UV rays. Because it was organically formed by extremely hot temperatures, marble in general has the ability to reflect enough heat to keep its surface nice and cool, a great benefit to any home or commercial owner living in the sweltering Miami heat! Not only is Crema Sahara Marfil marble thresholds attractive and cool to the touch, it’s also quite durable! One of the items in a dwelling that require a replacement is the threshold. With inferior threshold products like aluminum, vinyl, and even metal, they tend to rip, tear, and bend over a period of time. The life of an inferior threshold product can end quickly depending on the amount of traffic it endures. Front and back doors, kitchens and bathroom thresholds will usually get the most wear and tear. If you’re building a commercial dwelling, then it is highly recommended to steer clear of such inferior threshold products. The best solution is to install marble thresholds because it will withstand harsh conditions while still looking gorgeous. Even with Crema Sahara Marfil’s light neutral colors, the threshold is easy to clean and maintain. All that’s required is an annual sealant that will seep into the micro pores of its surface essentially sealing it up and creating a barrier against any dirt, dust, or grime that could get lodged in and put of a different kind of shading on the overall surface. Aside from the annual sealer, that’s really the only laborious thing you need to do when maintaining your Crema Sahara Marfil thresholds. These thresholds don’t require any strong chemical-cleaning agents—this would actually harm these kinds of thresholds. While they are strong and durable, these thresholds do have a weakness—acid. Any type of acidic substance, whether it’s a chemical agent or natural can harm the sheer gloss of a marble threshold. The absolute worst-case scenario is just that, it loses its gloss. You’ll still have beautiful Crema Sahara marble thresholds it’ll just have a matte finish, something that most buyers actually like depending on the kind of look they’re going for. Yet, chances are, its the gloss finishing that buyers prefer and if it’s what the builder installed in the first place, then it’s best to do what’s necessary to maintain its original look. Another thing you need to understand about Crema Sahara Marfil Thresholds is that they come in different styles. At Stonexchange, these marble thresholds are available in standard, single and double Hollywood bevels, otherwise known as handicapped bevel. Be Creative with Your Thresholds! For residential builds, most builders prefer Standard Double Bevel because it can be used in several different ways. In addition to being installed as a threshold, the Standard Double Bevel can be used as a baseboard. Choosing Crema Sahara Marfil Thresholds as a baseboard will line your space with a touch of elegance that regular wooden baseboards cannot do. The Standard Double Bevels are sometimes installed as backsplashes for bathroom sinks and kitchen countertops—an inexpensive way to add a touch of marble to a home while decoratively protecting the walls. Crema Sahara Marfil is perfect for such applications because of its neutral earth tone colors that complement most color variations. For commercial builds, contractors stock a bulk supply of Hollywood marble thresholds because they are ADA compliant. 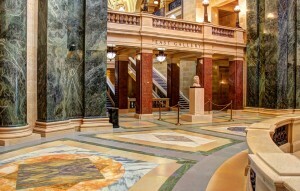 Hollywood marble thresholds are required by law to be installed in public buildings so that people in wheelchairs can easily cross over the threshold of any space. There are two kinds of Hollywood Bevels that are designed with a slight incline serving as a mini ramp for rolling objects: the Single Bevel and the Double Bevel. The Single Bevel has an incline on one side of the threshold. This is most beneficial for exterior doors or uneven floors. With the Double Bevel, the marble threshold has an incline on both sides, a feature that is best for adjoining rooms. Looking for a Custom Natural Stone Threshold? Stonexchange stocks a large supply of Crema Sahara Marfil thresholds in standard sizes for commercial and residential builds. However, if you’re in need of custom sizes, we can manufacture a bulk supply for you. Although, you’ll need to keep in mind that while we keep a sufficient supply in our Miami warehouse, custom orders need to be mined from our quarries overseas. So you need to take into account the amount of time it takes to manufacture and ship your custom Crema Sahara Marfil marble thresholds overseas. Call and talk to one of our representatives at 305-731-2400 to discuss a possible discount on your bulk order today. You can also contact us online.